The Corporate Slacker: Book Review – While the Code Compiles, by Unus T.E. and Sreekanth S.S.
Book Review – While the Code Compiles, by Unus T.E. and Sreekanth S.S.
As a species, I think, humans have an affinity for humour. Who does not like to laugh? Now the things that make us laugh vary widely. Close to twenty years after Jerry, George, Elaine and Kramer signed off from TV screens in the USA., I have yet to see anyone come close to finding the humour in daily life in quite that way. Yet, others will swear by FRIENDS, Big Bang Theory and even the puerile charms of Two and a half Men. But the desire to laugh persists, and television and cinema both echo with shows ranging from the exquisite (Modern Family) to the banal (too many to name). The ability to make people laugh through the written word, though, has been more elusive. While Cervantes, Dickens, Austen and Gogol used humour very effectively in their writing, apart from Henry Fielding, it would be difficult to pinpoint any classical writer who pursued humour largely for its own sake. Until, that is, PG Wodehouse came along and redefined the craft, largely by virtue of being a supremely talented wordsmith with a genius for plotting. But Wodehouse created humour out of the society he knew – upper-class England, middle-class America and the world of theatre, clubs and movies. It was left to Scott Adams to create the humorous icon to fit a modern age – Dilbert and his army of Dog-, Cat-, and Ratbert. I have had occasion, earlier, to review ‘A Dog EatDog-Food World’ by C Suresh, a witty and beautifully-crafted ode to Marketing Management. 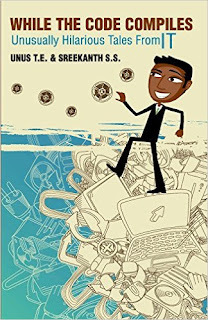 So I was curious to read ‘While the Code Compiles’ by Unus TE and Sreekanth SS, two IIM-Bangalore graduates (does anyone who isn’t an IIM alumnus even write anymore? ), just like C Suresh. It claimed to contain ‘Unusually Hilarious Tales from IT’, and while I had never worked in that industry, I knew enough people who had – certainly enough to know that there is scope for much humour in the corridors and cubicles of the glittering IT Campuses of India. 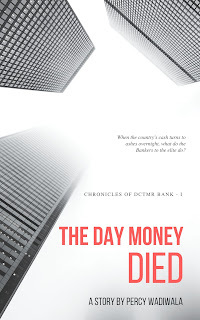 The Book follows 12 unconnected stories supposedly taking place on the Campus of Infopro Ltd., a fictionalised workplace that could by any generic IT firm in India. The stories focus on situational humour more than character-based humour. As such, there are no recurring characters, and those that are follow fairly typical young-engineer stereotypes; single, with a strong sense of oppression weighing on their shoulders, and uniformly girl-crazy. More senior managers are shown to be pompous, self-serving and largely lacking in anything resembling brain cells. Most of the dozen stories featured in While the Code Compiles induce more than a chuckle from the reader. Some, like Customer Devo Bhava, Gavaskar hates Cricket, The CMM Level 5 Canteen, Cultural Program Turns Culture-less Program and Encounter with Government are truly hilarious. They touch upon situations that are perfectly realistic, are quite tightly plotted, and as the climax builds up, lead to quite uproarious laughter too. The story of Gavaskar Nair’s 30-minute over at the Inter-project tournament, Dharani the system architect’s brilliant defence of Infopro’s botched software and the Ramayana play at Infopro’s Cultural night will make me laugh for some time to come, whenever I recall them. From spilled coffees to back-firing attempts to butter up an auditor, computers that take forever to load to canteen food that leaves everyone sick, Unus and Sreekanth have found the right situations and quirks to bring to a book like this. Some of the other stories drag a little, though, with the humorous situations dragged out too indulgently. For all the good things about While the Code Compiles (and do not get me wrong, there are many), I came off feeling that the clever plots and the humour inherent in the ridiculously inefficient spaces that are IT campuses could have been handled even better. It is said that Humour is the hardest genre to write, and this book, in its way, brings out why. In the written word, language embellishes the fun quotient in a way that direct action, or thrillers, or even romance perhaps does not need. As stylists, the writers could definitely have done more with their deliciously-funny stories, instead of sticking it in the same, mundane, dollar-paperback language that characterises modern Indian romances. Language that I would not have bothered with, had the story itself been mundane, made me sigh over here. I do hope that Unus and Sreekanth continue to hone their craft so that their future efforts combine their sharp observation skills and cynical humour with more stylish – and hence, funnier – prose. I found the cover attractive, given the subject of the book, and the quality of the paperback is also of a good standard. Editing is good, with only a few punctuation errors standing out. There are places where word usage and sentence-framing are iffy, but that really goes in rather with my observations on writing than editing. A few niggling errors stand out, especially in the story concerned with Cricket. The writers are advised that Guyana is a major cricketing centre, being a part of the West Indies (Shivnarine Chanderpaul, Alvin Kallicharan, Carl Hooper and Rohan Kanhai are but a few of the greats from that tiny nation). Further, in the famous Bodyline series, it was the Australian batsmen who were at the receiving end and not the English. At its price, While the Code Compiles is a decent pick. It will definitely tickle the funny-bone of anyone who has worked in the IT sector, as well as anyone who may have endured corporate life in India. A very pleasant afternoon read. The book has been received as a Review Copy. The reviewer is not acquainted with anyone connected with the book.